Campaigns consist of one or multiple projects and tasks. Instead of juggling a multitude of Excel spreadsheets and Word documents that are difficult to update and share with your team, you can now use the web-based project management capabilities of Aprix Marketing Manager to plan, execute, and track your marketing projects and campaigns. As you create Campaigns, you are also creating Projects. Each Project has key information based on the particular project type. Trade shows are different than Webinars, which are different from Direct Mailers and Print Advertising. Each Campaign and each Project needs to be treated differently and Aprix Marketing Manager gives you the power and flexibility to customize each of your Marketing Projects the way you need it. Because each “project type” has its own unique fields, you spend less time formatting and customizing it like you would do an Excel file, and more time creating and managing your projects. That’s the difference between Aprix Marketing Manager and other web-project management solutions. 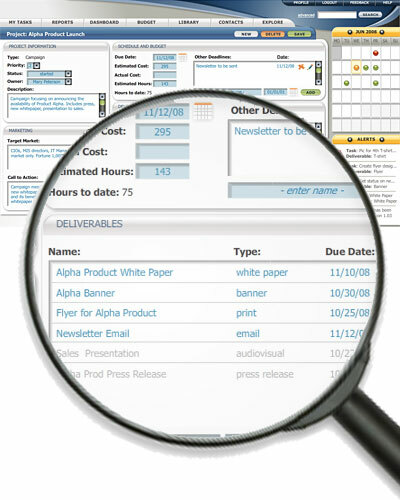 We give you project management tools that are geared towards the specific needs of marketing departments like yours.